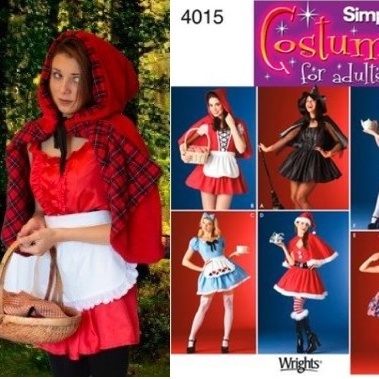 This page is an accumulation of the 3 main pieces in the Little Red Riding Hood Costume, which all came out of the same Simplicity 4015 patterns (below). The cape, dress and apron. There are also three videos to help, and tutorials for each. "How to Make a Cape" , "How to Make a Dress, How to make an apron. 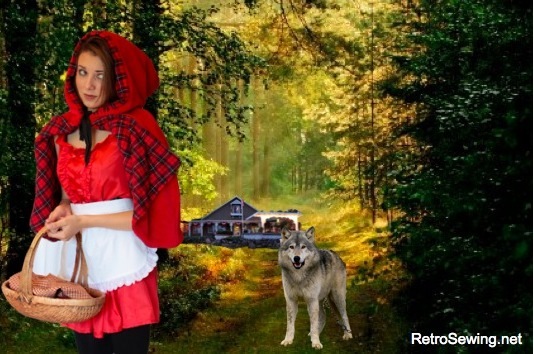 Check out this video (below) on the making of the "Little Red Riding Hood" dress. I used an old graduation gown that happen to be red, so it costs very little to make, but most red fabrics will do for the "Little Red Riding Hood Costume".The dress is even wearable for other occasions. The simplicity pattern 4015 (above) has so many options. Just add a basket, black leotards and boots to finish it off. Use these practical pieces all year long. Use the cape, dress and apron for multiple occasions. Just change the fabric and a few details. The photo above shows examples of all the ways to mix and match these pieces. Just add a basket, black leotards and boots to finish it off. These pieces are not just for Halloween costumes. Use these practical pieces all year long. Use the cape, dress and apron for multiple occasions. Just change the fabric and a few details. The photo below shows examples of all the ways to mix and match these pieces. Below you'll find a brief description of the cape, apron and dress. If you'd like the full details, just click the appropriate link and get the video, more photos, and step by step instructions. CAPE: I used fleece on one side and flannel on the other side, sewing it together for a reversible cape. As you can see in the photo pictured here, it is quite cozy and adorable. I used the "Make Poodle Skirt" pattern to make the skirt to match the cape. "How to Make a Cape" for all the details and video on just the cape. Keep in mind it is made using the 50s Poodle Skirt pattern by Simplicity. I made a summer skirt in blue gingham (pictured below), and a winter skirt in the red flannel (pictured above). Both the same pattern, but different fabrics for a completely different skirt. One of the best things about sewing is all the creativity. You can make it whatever you want. APRON: I made the apron out of old sheets so it cost nothing to make. See Make an Apron for full details and video on how to make just the apron. DRESS: I used an old graduation gown for the dress. It is a silky polyester that cost 0. It's dressy enough for a party. Just add a belt or not. Check out How to Make a Dress (Little Red Riding Hood Dress pattern) for full details on how to make just the dress. So all in all this costume cost very little. We used an old sheet for the apron, an old graduation gown for the dress. The fleece was about $15. so not bad for a high quality costume with multiple uses. Not only is this Little Red Riding Hood costume practical, and the pieces useful year round, it is also comfortable. Use the basket as a purse, and use leggings or leotards with boots for total warmth and comfort. Doesn't get much better than that.